One of 80,000 documents now available on the Department of State’s electronic reading room. The Department of State’s launch of its new Freedom of Information Act (FOIA) online request platform and terrific, comprehensive, 80,000-document online FOIA reading room, makes it a fitting time to review how to craft a good FOIA request to the Department of State (or any agency, actually). Frequent filers of FOIA requests know that Department of State is one of the most responsive agencies when it comes to requests, appeals, and working with requesters to obtain as many responsive and relevant documents as possible. Let’s make their job easier by submitting well-written requests. 1. Make sure that what you want to send is a FOIA request and not an MDR (Mandatory Declassification Review) request. The process of filing an MDR request is similar in many ways to the FOIA, however MDR only applies to security classified records, or records that are protected for national security reasons under EO 13526, as amended. The request must be either for specific documents or a narrow range of documents that the agency can locate with minimal effort. 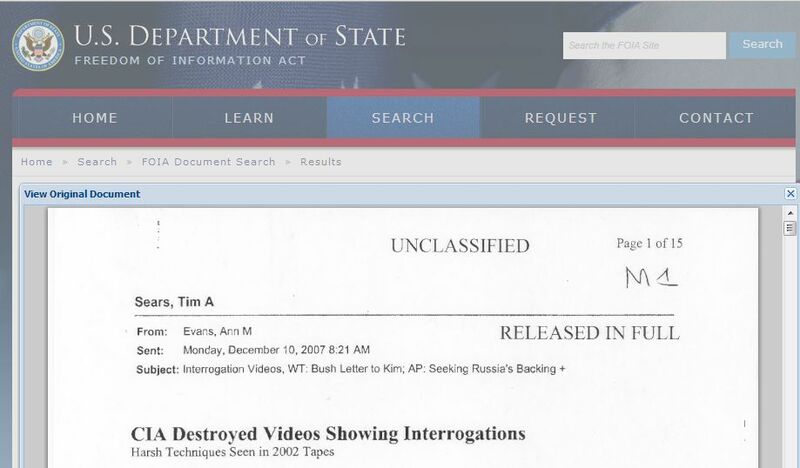 If the document is not classified, you can only request it through the FOIA. 2. Include a reasonable time frame for the documents you are searching. Including dates can help FOIA officers find documents faster and to make sure they are relevant to your request. However, be careful. If you give too short of a time frame this could seriously limit the documents FOIA officers can find (ex: not including several days after a conference you are seeking information on when DOS reports and cables need a few days to be cleared and sent). If you make the time frame too broad, researchers could end up with hundreds of documents and many of little interest to the requester. 4. Include footnotes, articles, other publications, or previously declassified documents that reference the subject of your request. When crafting the body of your FOIA request, including footnotes, articles, or other publications that deal with the subject of your request can help give a FOIA officer some background knowledge and distinguish relevant responsive documents from irrelevant ones. Including previously declassified documents that reference the subject of your request can also direct a FOIA officer where the best place to start researching and find the most responsive documents to your request would be. 5. Be straightforward; no one is trying to hide information. Despite what some conspiracy theories might suggest, FOIA officers are not looking to keep information from being released because of political leanings of a requester or even the purpose of the request. The law is clear and their job is to release as many documents to public as possible, unless the release is legally prohibited by a non-discretionary FOIA exemption (information still properly classified, for example). Be as clear as possible of what you are searching and include as much background information as you know. A FOIA request should not be a guessing game. such helpful suggestions, Thanks! and wow, what a great new State Dept. electronic reading room! I´m a huge fan of The National Security Archive :). Great post!